If you’re looking for yet another sign that the end is near, the media has been buzzing (pun-intended) with reports that billions of cicadas will be burrowing out of their underground holes soon and swarming the East Coast of the United States. Okay, so “Cicadapocolypse” – what many entomologists are calling the insects’ mass exodus from the ground – may be a bit sensational considering that the bugs would hardly hurt a fly, but the event likely will be painful to our ears. Some experts predict that the noise the cicadas emit could even be comparable to the sound of a New York City train. The gigantic batch of cicadas – called Brood II by entomologists – is a specific type that hatches every 17 years on the East Coast. The mass hatching will take place from North Carolina to Connecticut, and is estimated to happen between mid-April to late May or when ground temperatures reach approximately 64 degrees (these bugs are an exacting bunch). 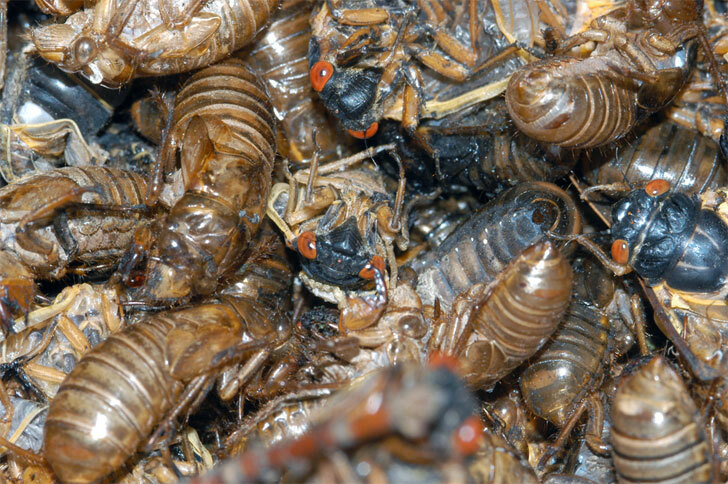 Brood II cicadas will have dark-colored bodies and bright red eyes and while they aren’t at all harmful to humans, their sheer numbers may be a nuisance for those that don’t like seeing those empty brown cicada shells everywhere. The swarms will also be emit a sound that will not be music to most people’s ears, so be prepared to deal with a bit of extra noise pollution for about 4-6 weeks. But we won’t be hearing from the Brood IIs for a while after that, as the next hatching will take place in 2030. Cicadas are beautiful and amazing insects, and their noise IS music to my ears. They develop more coloration as they mature too, ever increasing their intricacy and beauty. I remember the last mass emergence from when I lived close to the east coast. It was fun and fascinating for us as kids to see and hear the curious creatures. I wish this article were more generously worded- as it's possible to take advantage of a public spokes position to open people's eyes to natural wonder, rather than make a negative focal point out of what could be a marvelous happening. Thank you for the news nonetheless.